A consultation is required before submitting your work. The rates listed below are estimates; every manuscript is unique! Call (828) 254-8111 or email writersw@gmail.com today to get started. ​Electronic submissions: Email your manuscript as a Microsoft Word Document (1" margins all around, double-spaced, 12 point font) with "Editing" in the subject. ​Please include your contact information on the first page, and put the beginning of each chapter on a new page. Hard copy submissions: Mail your work to The Renbourne Editorial Agency, 387 Beaucatcher Rd., Asheville, N.C. 28805. Please enclose a self-addressed stamped envelope along with your check. These are general rates. They may change depending on the genre of your work, especially theses and academic/technical writing. Call or email us to discuss your work and confirm rates. Reading and editor's critique of manuscript without editing: $3 per page. Writing coaching: $40/hour, online or in person. Payment is in advance via Paypal*, check, or money order. ​Checks and money orders can be made out to The Writers' Workshop, our parent organization, and mailed to 387 Beaucatcher Rd., Asheville, NC 28805. *Paypal invoice will read "The Writers' Workshop." 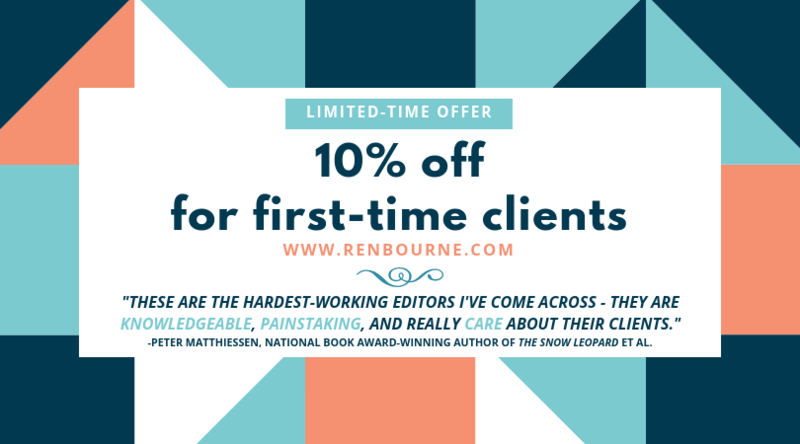 Considering Renbourne Editorial for the first time? Mention this ad and get 10% off!